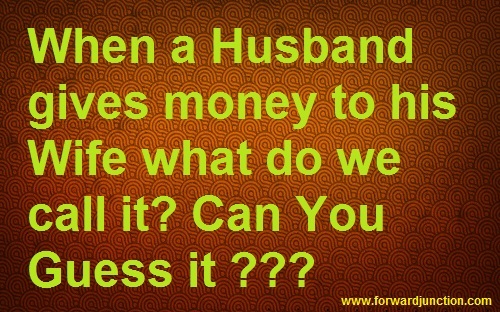 When a Husband gives money to his Wife what do we call it? Money has different names !!! In temple its called Daan, in school its (fee), in marriage it's called (dowry), in divorce (alimony), when u owe someone its (debt ), when u pay the government (tax), in court (fines), civil servant retirees (pension) boss to workers (salary), master to subordinates (wages), children (maintenance), when u borrow from bank (loan), when u offer after a service (tip), to kidnappers(ransom)illegally received in d name of service (bribe). 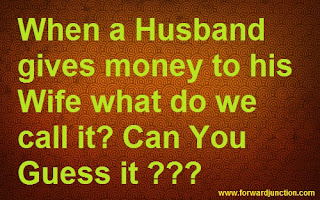 The question is "When a Husband gives to his Wife what do we call it? Solve it if you are a genius !!! The collection of Puzzle posts in this website also will help you to solve similar puzzles in the competitive examinations like PSC, entrance exams and other exams that includes logical puzzle section. All the answers for puzzles are providing free of cost. Pin Money (Though there are several answers for this Pin Money can be a good defenition for it.